Home > Here’s Chicago announces new Holiday Party Planning print guide to debut in summer 2017. Fresh off the heels of a breakout 2016, Here’s Chicago, the event resource where meeting, party and event planners find the best event planning venues & services, has announced a new Holiday Party Planning print guide to debut in summer 2017. The publication will assist meeting and event planners in organizing the perfect holiday party. 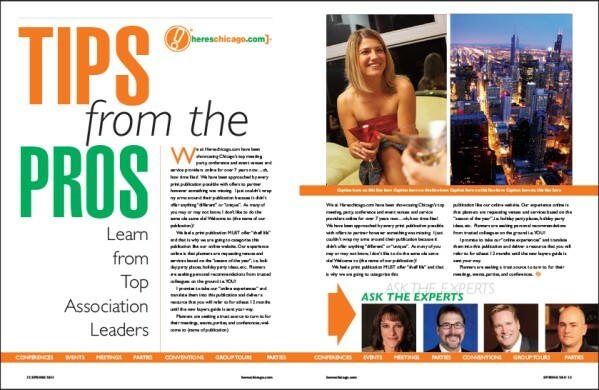 Forward-thinking articles written by industry insiders will offer guidance and organizational tips for those tasked with planning holiday parties for their company, association or clients, while a comprehensive venue guide will showcase some of Chicagoland’s most stunning locations and hidden gems. The publication launches at a time when interest in Here’s Chicago is at an all-time high. This past year, website visitors to HeresChicago.com soared by 46% and the firm delivered over 4,000 group leads to its current listing members. The guide will debut in July of 2017 with a print circulation to Chicagoland’s largest corporations and associations, plus professional meeting and event planners who book business into the Windy City. Additional distribution will occur at Here’s Chicago Live events, plus the guide will be featured online on HeresChicago.com and the company’s monthly newsletter. For more information about the Here’s Chicago Holiday Party Planning Guide, download the media kit, or contact Theresa O’Rourke at 630-794-0696, or email Theresa@PtmGroups.com. To learn more about Here’s Chicago’s digital holiday party marketing packages, contact Jim Grillo at 312-804-2710 or email Jim@HeresChicago.com.